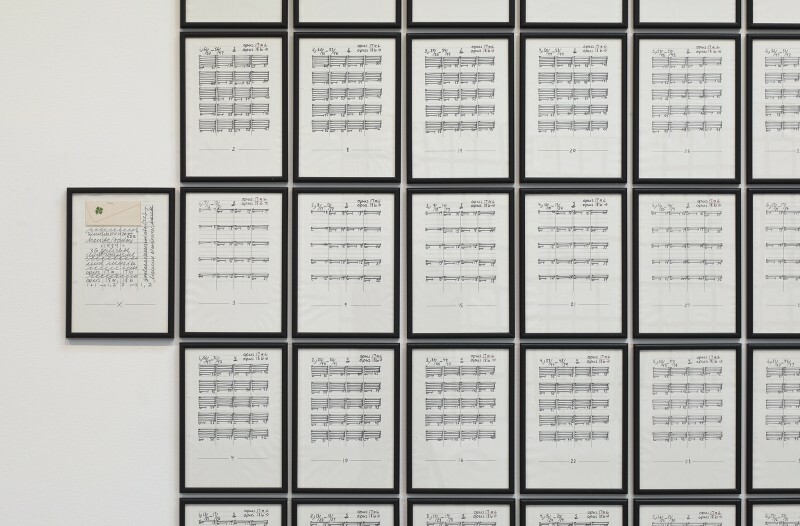 Regen Projects – Los Angeles is pleased to announce an exhibition of the work Wunschkonzert (1984) by Hanne Darboven. Originally shown in Documenta 11 (2002) as a collection of loose pages in folders, this monumental piece consists of 1008 pages of uniform size divided into 4 Opus’s (Opus 17a and b and Opus 18a and b). Each Opus is comprised of 36 poems, and each poem is made of 6 pages plus a title page on which an antiquarian greeting card celebrating a Christian confirmation has been collaged. The poems reveal a rhythmic movement in their increasing and decreasing rows of numbers, and the checksum values are represented in digits and line-notations (17a, 18a) or by digits entered into a grid (17b, 18b). This work adopts musical methods of movement and repetitive rhythms and was conceived against the backdrop of musical compositions by the artist. 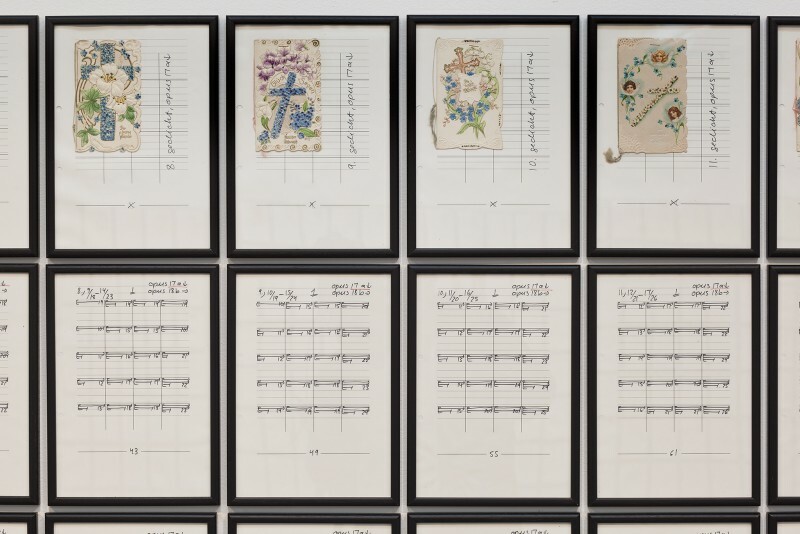 Darboven briefly pursued a career as a pianist and evidence of her interest in music can be found in the form and structure of many of her works which have musical connotations. Several of her pieces have been translated into musical scores that have been performed. The title of the work refers to the Sunday afternoon musical request program of the German Norddeutscher Rundfunk radio station where felicitations were often broadcast. 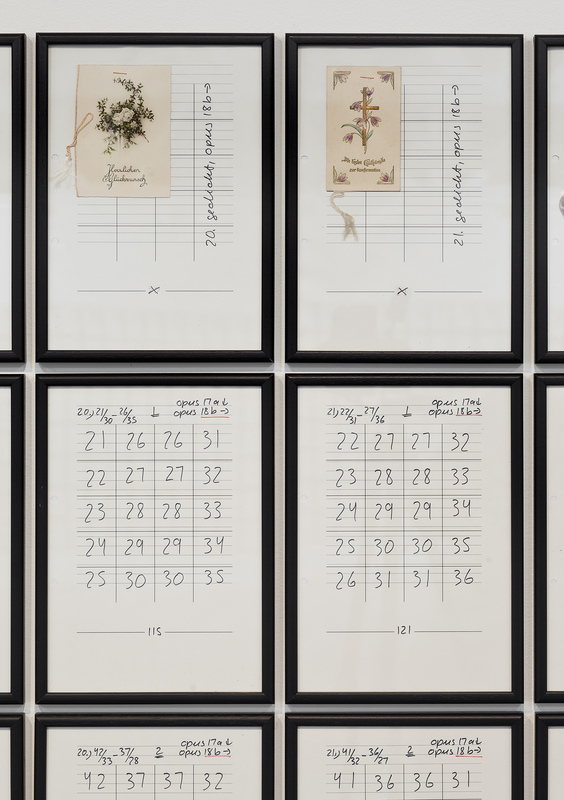 Time formed the foundation for Hanne Darboven’s conceptual artistic practice. Her installations, whether intimate in scale or filling an entire exhibition space, created architectures of time. Much of Darboven’s work originates from personally derived numerical sequences based on the four to six digits used to notate the date, month, and year of the standard Gregorian calendar. The calendar sequence has consistently formed the basis for the majority of her installations, and offers a system to represent both the continuous flux of life and a clear, all embracing order. Through the actual writing of her numeric constructions or their graphic translation (u-shapes, wavy lines, grids, boxes, and line notations), Darboven personally relates to time, endows it with a concrete form, brings it into experience. “[R]andom sampling and aleatory choice from an infinity of possible objects (Ruscha’s Twenty-Six Gas Stations, Warhol’s Thirteen Most Wanted Men) would soon become essential strategies of the aesthetic of Conceptual Art: one thinks of Alighiero Boetti’s The Thousand Longest Rivers, of Robert Barry’s One Billion Dots, of On Kawara’s One Million Years…. Or again, there are works by Stanley Brouwn or Hanne Darboven where in each case an arbitrary, abstract principle of pure quantification replaces traditional principles of pictorial or sculptural organization and/or compositional relational order. Hanne Darboven was born in 1941 in Munich, Germany and died in 2009 in Hamburg, Germany. She exhibited in numerous national and international exhibitions including “Live in Your Head: When Attitudes Become Form: Works-Concepts-Processes-Situations-Information” at the Kunsthalle Bern (1969); Documenta 5 (1972), Documenta 6 (1977), Documenta 7 (1982), and Documenta 11 (2002) in Kassel; “Reconsidering the Object of Art: 1965-1975” at the Museum of Contemporary Art, Los Angeles (1995-96); and “Hanne Darboven, Bücher 1966-2002” at the Westfälisches Landesmuseum, Münster (2002). Her work is included in a number of international collections including the Schaulager, Basel; Centre Georges Pompidou, Paris; the Solomon R. Guggenheim Museum, New York; and the Museum of Modern Art, New York. Images courtesy of Regen Projects, Los Angeles. Photos by Brian Forrest.